Sorry if the video doesn't follow standard. I don't have a zoom len. Just had my daughter following me for a few turns. 1. Try ask the cameraman to film from a stationary position because moving shot is harder to analyze. 2. 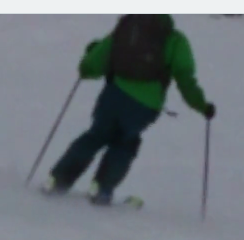 When you release, your skis separate which is a sign of lack of free foot management. This is a common problem. I spent a lot of time this season working on my free foot and developed a much strong free foot awareness and control. It no longer dangles there and go for a ride. I highly recommend you to dedicated some time just on focusing on your free foot. Your fore/aft, balance, and control will improve dramatically. 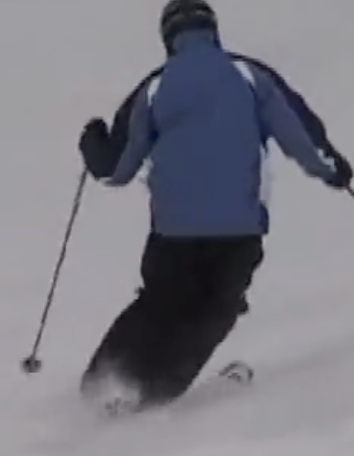 Video tip: have your camera person keep filming as you ski past them for 4-5 turns. The side and rear views are as important as the front view. Terrain/Skiing tip: for learning and MA, find a green groomer and ski as slowly as you can, making complete turns. 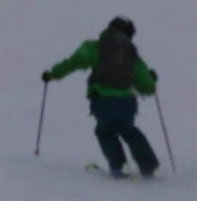 This trail is too steep to learn new movements, which is evident in the "rushed" quality of these turns. Your free foot management has improved. It only got away from you on one turn. Suggestion: replay that turn and try to analyze why it happened. Is there enough CB and CA and is the timing right? No. You CA/CB with your head. CA/CB must begin from the pelvis up, not the head down. Does LTE tipping continue throughout the turn? Yes, but more is needed. Tipping should continue to increase throughout the turn. SMIM: you need more tipping/flexing, but so does almost everyone. At this stage I think your SMIM is upper body movement. Without effective CA/CB, it's not possible to get "upside down" in the High C, which leaves you vulnerable to lateral heel pushing before the new edges engage. Suggested drills: Angry Mother and No Swing Pole Plant. Download the videos from the HSS site and do each drill in order until you've mastered it. Don't skip any drill, no matter how elementary it may seem. Your current upper body movements are upside down (not in a good way! ), so you need complete movement retraining in this area. 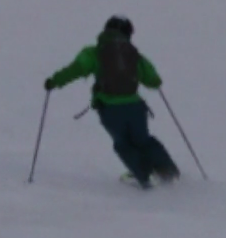 PMTS upper body movements are not intuitive and no one ever skis their way into them (I once thought I did... I was wrong). They require conscious and active use of muscles in ways that feel "wrong" to almost everyone. The videos provide the necessary guidance. Here is one more try at blue slope with slush condition. 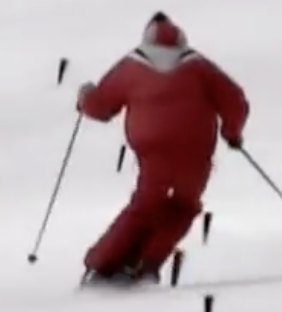 Among other things ,your skiing does not include using the front third of the ski, thus obviating any chance to load and utilize the energy built into the ski. There is no slicing movement, just a push after the belly of the turn. 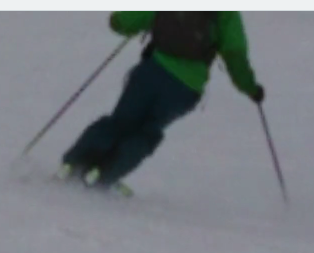 Obviously earlier tipping would be the answer, but along with drilling for that, when you free ski, try to be more aware of your fore and aft balance on your skis. Once you increase that awareness I think the tipping will be made more achievable. Thanks. I will try to practice fore-aft more. The reason for no slicing movement was the slush snow. It cannot hold when pressure is building. I don't think I push off during release. Any other comments? I don't think tipping is my main weakness. 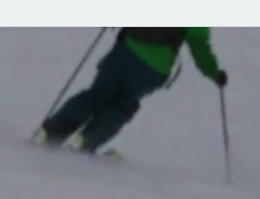 Anyway here is video clip on almost perfect groomers. It contains me and my two daughters. Hope this one will get some real advice on how to improve further. 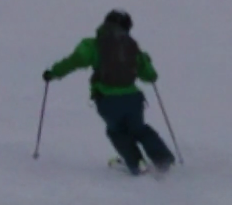 You are a strong skier, but its not clear if tipping is your SMIM or not...thats why I suggested getting video of deliberate movements on a slow piste. 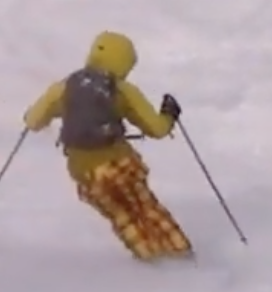 It could in fact be that tipping isn't your SMIM, but one thing is for certain: the speed you are skiing at is beyond your tipping skills because there is tail-pushing here. I posted these images in another thread, and I think they can apply here. Here is a still from your video. I haven't cherry picked this image, we see the same thing in every turn. I hope that helps. For what its worth I'm going for my coach accreditation this year. Hopefully Max_501 can weigh in. This one is tricky because I think a lot of the right movements are there. ps. your children are quite the skiers! Hmm, I slow down the video for you. Let me know which second I am doing tail-pushing. Simple answer is: every turn. 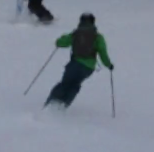 It's not necessarily something you are doing at a particular second, it's something thats ingrained in your skiing. The more important question you should ask is why your lower body isn't showing signs of tipping. This is my opinion and anyone is free to disagree, the MA section is also for learning how to give MA...and like you I eagerly wait for the experts. You are bouncing around lack of tipping and heel pushing. Without tipping I won't have high c round turns. Anyway I know my CA on left turn can be further improved. I am still working on it. Also inside hand can be more disciplined. In the slow motion version of the video you posted, I see what appears to be a wedge-entry/lack-of-tipping. It seems that you are hanging onto the big toe edge at 0:05, 0:08 and 0:11, rather than tipping-to-the-little-toe-edge-of-the-new-free-foot-while-still-on-the-little-toe-edge-of-the-new-stance-foot. I can't tell (and, like I said, I'm not qualified to make any suggestions) if it's an alignment or movement issue. If a PMTS expert says otherwise, then, of course, please ignore my comment. Work on establishing balance on the LTE before the release. The High-C portion of the turn is rushed (this is where the tail push is seen). Increase inside foot tipping. Work on including the pelvis with the torso for CA or CB. Do you have any video of slow one and two footed releases? Have you worked on the Super phantom with touch-tilt?